The researchers Michael Huberman and Chris Minns published estimates of weekly work hours going back to the late 19th century. This data – shown in the following visualization – shows that over this time working hours have steeply declined. Full-time workers in these countries work 20 or even 30 hours less every week than in the 19th century. Working hours have decreased dramatically since the Victorian period. The world map shows the hours worked per year per engaged person. The author is surprised by the short work days especially because some societies, as the Hiwi from Venezuela often suffer from hunger and although they achieve 'high returns from each hour of work' they still generally forage for less than 2 hours. Generally the work time in hunter-gatherer societies is lower than in agrarian societies. 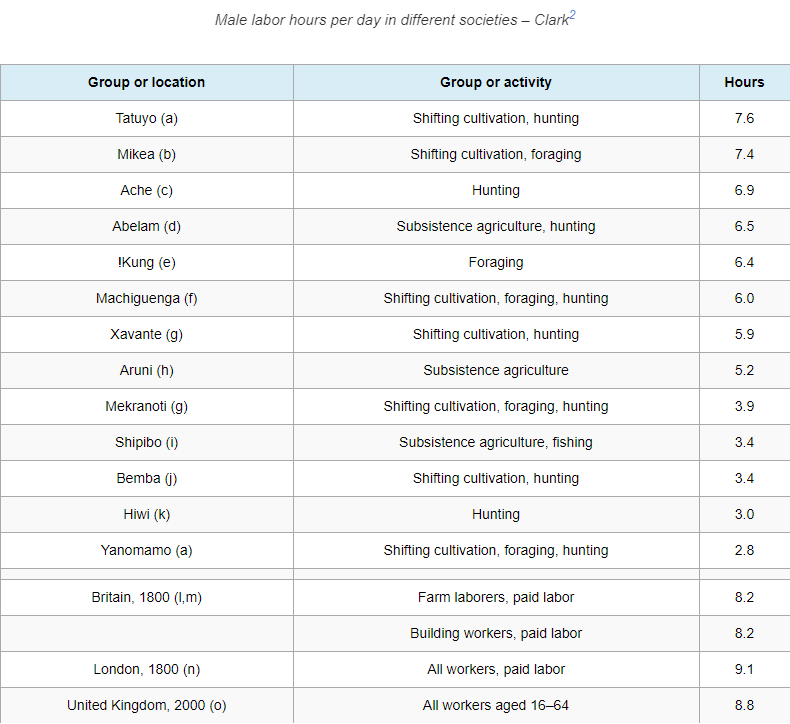 These are the labour hours worked by men. Productivity increases also entailed decreasing work hours per week. This relationship – in the cross section – is shown in the following data visualization. Valerie Ramey and Neville Francis (2009)3 have studied how work and leisure have changed over the course of the 20th century. The chart below shows how hours worked in home production have changed. The activities included in home production are: planning, purchasing goods and services (except medical and personal care services), care of children and adults (both in the household and outside the household), general cleaning, care and repair of the house and grounds (including yard work, but excluding gardening), preparing and clearing food, making, mending, and laundering of clothing and other household textiles. Should employers let workers start late to stop them dying early? As their source the authors almost entirely rely on time diaries. Substantial decline of working hours for women. The authors find that "there were significant declines in time spent in home production by women in every age group". You can see the data for women broken down by age group here. Gender roles are changing and men work increasingly more hours in the household. For men the authors find that time spent in home production increased for every age group. Men between 25 and 54 increased their home production time from 3.7 hours per week in 1900 to 17 hours per week in 2005. The data broken down by age group is presented here. As productivity in the household increased working hours in the household declined. In contrast to the broad definition of 'home production' by Ramey and Francis above, here housework excludes for example time spent with children and focusses on a narrower definition of three household chores: meal preparation, laundry and cleaning. 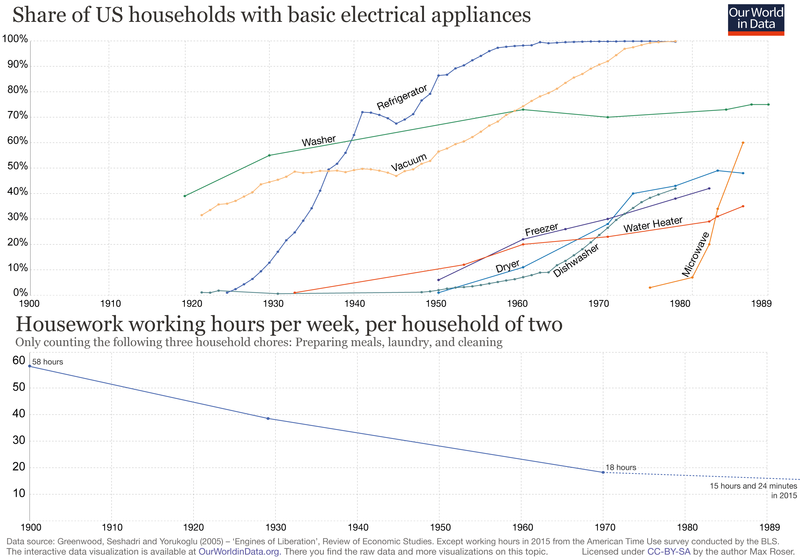 This chart shows how over the course of the 20th century more and more household appliances became available in more and more households.This chart is available in an interactive version here.